It's been a good twenty years or so, it seems to me, that Kraftwerk really has done any significant amount of new studio work, though I don't know if they've ever really considered themselves as 'on permanent hiatus' or anything. In that way, I suppose they would be rather like the Who, but this comparison stops right then and there. For instance, I wouldn't imagine seeing a Man-Machine playing pinball with the blind intuition of Tommy, but rather he/it would more likely plug in à la R2D2 and simply take it over. 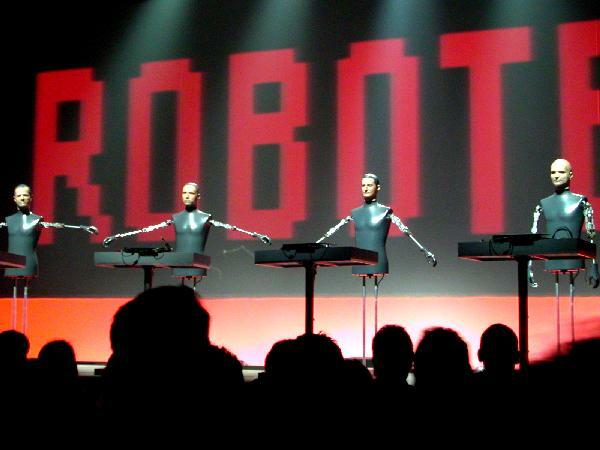 Of course, Kraftwerk's pioneering use of the synthesizer in pop music is well-known, starting from their breakthrough 1974 "Autobahn" album and single, and then carrying on through the restless 1970s with continued success. During this time of course, the scope of popular music changed rapidly and radically, with punk and disco emerging to kick aside the (dare I say) more cerebral "classic rock" from the airwaves. The end result was the persistence of neither, but rather the schizoid 1980s mix of largely-electronic New Wave and largely-brainless Hair Metal. But one thing was forever set in stone; the synthesizer was proven to be a versatile tool for music-making, no matter how horrible that music was! Looking back to my own childhood, I can remember the silly 1972 radio hit "Popcorn" by...the duo of Stan Free and Gershon Kingsley (OK, I had to look that up), as my personal introduction to the synthesizer. I know that I must have heard "Autobahn" on the radio in the coming years, though I don't know for sure that I made much note of it... I was much more interested at the time in loud guitars, and only Jon Lord when it came to keyboards. 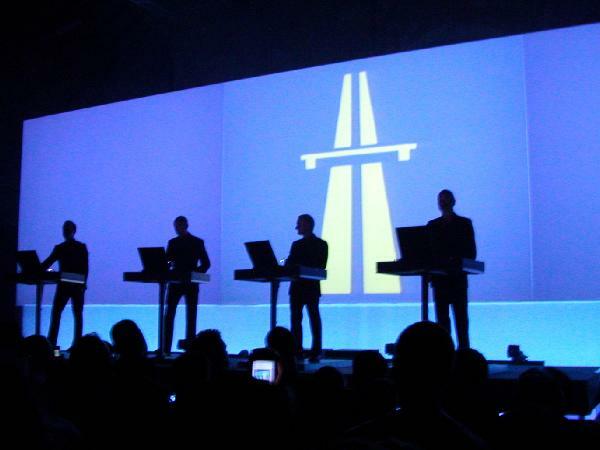 Hence, Kraftwerk was never a favorite artist of mine, and it wasn't until my discovery in the '90s of the wonders of the other (sadly) less-known German electronic pioneers (eg., Neu!, Cluster, Harmonia) that I learned of their important pre-Autobahn heritage. Of course, Neu! (whose 1972 debut is IMHO an even truer foreshadowing masterpiece of today's 'electronica') was essentially a Kraftwerk spinoff group (Dinger and Rother both having been with them around the time of the first "red traffic cone" album). But it was only the robo-beats of Kraftwerk and the minimalist ambience of Berlin's Tangerine Dream that in the end got worldwide recognition even amongst the un-hip. Anyway, when Kraftwerk announced a show here in the Swiss capital of Bern (just an hour away), I decided I should at least take this opportunity to see what Kraftwerk live might be all about. Despite the lack of any pre-show "preparation" on my part, the show was really quite close to what I expected. (For instance, I was quite sure I would not see Florian Schneider playing the flute.) I don't remember ever seeing live photos of their stage show, but based simply on the style of the album art and the designs I've seen on t-shirts, I was generally aware of the 'line of consoles' arrangement of the foursome. In addition, while I knew that *two* of the foursome would be co-founders Ralf Hütter and the aforementioned Schneider, the other two guys would have to remain nameless. (Perhaps they are Henning Schmitz and Fritz Hilpert, who I see listed on discographies.) Even before the curtain opened, the back-lit silhoutte of the four was projected forward and indeed revealed such a configuration. Thinking that perhaps Kraftwerk *had* gone largely forgotten as a relic of the past, I was surprised to see a packed house (on just the first of two consecutive nights in the Grosse Halle) of something like 5,000 (I'm guessing). Well, ok, the youth of Switzerland are rather fond of techno it seems, if the massive popularity of the Zürich Street Parade were a true indication, so I guess many of the local youngsters were, like me, curious about these founding fathers of all things "Tron," who thought of everything *except* maybe to put "DJ" in front of their names. To give a fair evaluation of the show is somewhat difficult... not surprisingly, the four members are all but motionless throughout the performance. And one never can tell just how much of the music even requires human interaction. And for awhile even, most of the vocals were computer-generated, not just computer-altered. Later on, Hütter (on far stage right) who was wired up with a compact microphone headset, began to take over the bulk of vocal duties. Oddly, he had a peculiar tendency of placing his open right hand along the side of his face, as if calling the kids to come in for dinner. Whether that was supposed to make his voice project better, I can't guess, but as it was done with robotic efficiency, it never seemed to spoil the presentation. Anyway, since the performers were hardly putting on a show, it was the massive projection screen behind them that was the recipient of the bulk of the public's attention. True to form, the synchronization and content of the images was perfect for the music. The casual music fan in attendance might have only seen this sort of thing before at, say, a Pink Floyd concert. For me, as a veteran spacerock fan, it was hardly anything unusual, though here we get actual meaningful content to accompany the music, as opposed to twirling blobs of color and flashing lights (nice though those might be). And so, I really enjoyed this aspect of the presentation. Kraftwerk opened with "Die Mensch-Maschine" (I'll give the German titles, since here nearly all the lyrics were in German), which was an appropriately bombastic introduction. 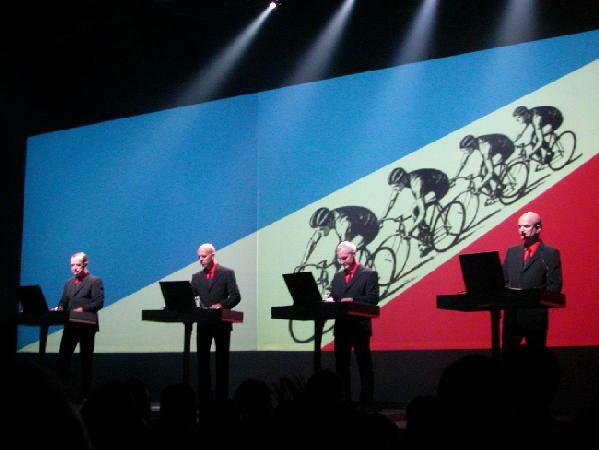 Not long thereafter came two different versions of their "Tour de France" theme (Hütter is a cycling fanatic from what I've read), which was originally done in the early 80s, but has seen the light of day once more on a recent CD, that was the impetus to put this tour in motion I imagine. This material I was unfamiliar with, but the repetition inherent in the act of cycling indeed provided yet one more good analogue for the 'motorik' style of music invented there in the Düsseldorf/Köln region. "Vitamin" was stuck in the middle here somewhere, an interesting track accompanied with great visuals of tumbling capsules and dissolving Alka-Seltzer tablets, that comes across (whether intentional or not) as a poignant and satirical look at the bombardment of TV pharmaceutical advertising. At least it did to me, as an American (we don't have that here in Switzerland so much, yet!). "Autobahn" was surprisingly placed in the middle of the set, though as a rather laid-back affair it didn't really have the energy as a closer or encore, so it made sense in the end. It was kept to near 'single' length, and was not surprisingly accompanied by movies of highway traffic intermixed with the album art and the idealized roadsign symbol for Autobahn that is used here as well. The strongest two moments of the performance, however, were on opposite sides of the equation. The light and airy "Das Modell" (from 1978's 'Die Mensch-Maschine') was interestingly the track that got the largest number of people dancing about (hardly a 'rave-ready' song, that! ), but soon thereafter the title track from 1975's 'Radioaktivität' changed everybody's mood. The extra intro bit that (robo)chanted "Tchernobyl, Sellafield, Harrisburg, Hiroshima" let us know what was coming, but still the unsettling e-beat throbbing and alternating yellow/red flashing on the screen was rather startling (and sobering). "Trans Europa Express" was the closer, and I was surprised I recognized this song, as I know I never have heard this album, so the song must have had significant radio play in America when I was a teenager. Guess what? We saw images of trains throughout! In fact, the TEE itself. The first encore seemed to be medley of the first side of 'Computerwelt,' with all things numerical dancing upon the screen. Then the curtains closed once again, only to open to reveal four mechanical robots in lieu of the four musicians. The faces were extrememly well done, as they had identical features to their human masters (I wonder if they ever get them in the wrong order! ), though they all looked a bit younger (meaning that they are leftovers from 1980s tours I presume). Their arms moved in choreographed maneuvers while the track "Die Roboter" was piped in (duh! ), and this was the most animated part of the show no doubt! The curtains closed once more, and revealed once more the actual human-Kraftwerk, but now dressed in tight black outfits with those fluorescent green scan lines. A nice effect, though the music they played ("Elektro Cardiogram" and "Aerodynamik" from the 'Tour de France' CD and "Boing Boom Tschek (Music Non-stop)" from 'Electric Cafe') was unknown to me and less interesting.